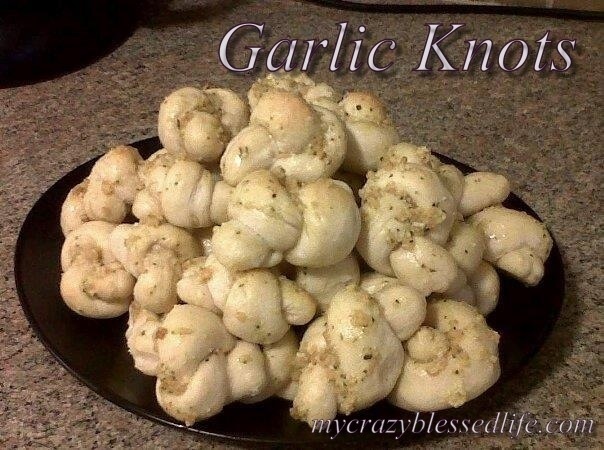 Garlic Knots | My Crazy Blessed Life! I love Italian food more than any other type of cuisine, and one of my favorite things to eat at Italian restaurants are garlic knots. They are little knots of bread covered in olive oil and garlic that are like heaven in my mouth! I’ve got a recipe that I have been using for years and it is tried and true wonderful. I use my stand mixer with the dough hook for these, but you could also use a bread machine on the dough cycle, or mix by hand. First stir together the water, salt, sugar and yeast. Let it sit for about 5 minutes before adding the flour. Add the flour and knead for 5-10 minutes. The dough will be smooth. Put the dough in an olive oil covered bowl and make sure the entire ball of dough has olive oil on it. Place the bowl in a warm dry place to rise until doubled, or about an hour. When it has doubled grease your baking pan or stoneware (I like the stoneware baking pan for these, they always turn out great) with olive oil. Pull off small chunks from the dough and roll with you hands to make a 4 inch rope. Then tie in a basic knot and place on your greased baking sheet. Bake them in the oven at 350 degrees for 20-25 minutes or until the tops are just starting to brown. While they are baking mix up the topping. As soon as they come out of the oven use a pastry brush to coat the with the garlic oil coating. I let them cool a bit then pour it all into a bowl and gently stir to make sure they are completely coated. Serve warm! Definitely going to try these next time instead of my regular breadstick recipe. They look wonderful. Thanks!